Another finish! A big finish! A cathartic finish! 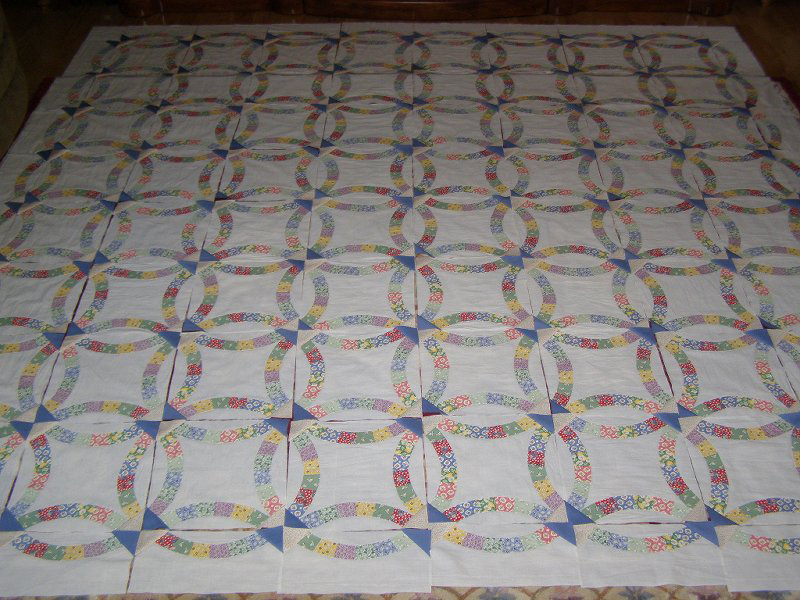 This double wedding ring quilt (DWR) started out as an extremely ambitious gift for my girlfriend for her wedding. The problem? I was brand new to quilting, no idea what I was doing and thought tackling curves would require the same level of concentration/skill as straight piecing. Yes, funny… go ahead and laugh, I’ll wait. Done? Good, back to my story. So years ago I visit and she’s got a 1930s home they were fixing up and while doing so, keeping its original lines and architectural feel. A quilt with reproduction prints (Aunt Grace) was in order. The DWR specifically b/c of the occasion. I know it would blend her home and bedroom beiges and tans and greens (her concession to the new husband) beautifully while giving her some color (what I know she craves). For the background, I used a muslin bought at JoAnn’s b/c I wanted to keep in the same theme of repro. –sigh- I didn’t think much about fabric weave and bought a pretty thin muslin. I have a few posts in my history regarding this DWR, talking about my frustration in trying to piece it correctly, trying a Curve Master Foot (which at the time helped but didn’t solve my problem. (Here, here, here, and here) Today, however, with more practice, it’s AN AWESOME TOOL for curve piecing! ), and the overall method I settled on. I slowly pieced it all together for this king sized monster and then, the top sat. How the heck was I going to quilt this? I had been eyeing a mid-arm machine and frame and decided now was the time to get it. I bought Mr. Sumo and Ms. Midge and then, of course, was not going to attempt this DWR until I practiced real quilting. Life interferes, we have a couple temporary moves, much of my sewing/quilting projects and supplies are in storage for a couple years. I pull them out and find water stains on the quilt top. But thanks to the quilting community, advise was asked and provided. Quilt it anyway, you said, then when you wash it, put a color catcher in with the wash and it worked. However, as I started quilting it, 2 things happened. Hubs really began loving this quilt and I began thinking it wasn’t good enough to send to my friend. Knowing what I know now about fabrics, how I personally have improved in my own sewing and quilting and the uncertainty around whether that stain would come out while I was quilting. I decided, finally, to keep the quilt for hubs and I. We didn’t have a bed quilt and summer was coming. This gave me a little more comfort to practice different quilting ideas (I have one small side of the quilt where I have several different quilting motifs that I’ve tried out and not bothered to unstitch knowing it was going on our bed.) It also let me enjoy quilting it a little more. I put this baby on our bed to surprise hubs that we were keeping it and my baby girl decided she had to mark it. I caught it right away and no mattress damage or actual quilt damage once cleaned but you could have defined me as a red-faced, steam coming out my ears, livid when she did that. The final shot of where it resides now for the summer (it’s a thin quilt). I don't blame you for keeping it, its lovely. It's absolutely stunning, what a challenging quilt to tackle. Congratulations on finishing it. WOW!! It looks amazing, and I am in awe of you tackling such a huge project with vigor :) It looks absolutely professional, and the quilting is amazing! Glad you are keeping it to enjoy. Im still laughing as I write this comment. I love the look of double wedding ring but Im not sure I have the mental chutzpah to give one a go yet. Despite all the drama this quilt turned out so beautifully I think it was worth the angst. 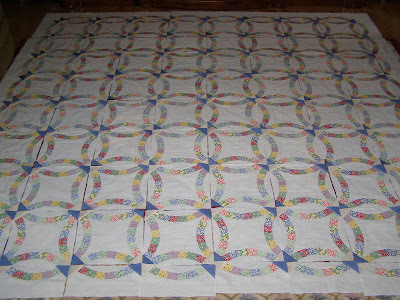 That quilting is perfect for the quilt. I dont know how you gave it away. I would have been hanging on to it for dear life. Beautiful quilt! It looks like it fits perfectly on your bed. Words cannot express...so glad you kept it...I am still waiting on mine...Lovely, lovely lovely! Looks beautiful--you did a great job! What a fabulous quilt! And a great story. So glad you perserverred. I didn't know a mid arm needed a frame. Thought it was the one you sit at. Whatever, you did a marvelous job. Fabulous Becky!! I have one that I started I think it's been close to 10yrs now. I MUST get it finished.